Here's a neat trick for losing weight: Become a strict vegetarian for 3 days. Before you yawn or say "Yecchhhh! ", let me elaborate. Pick some time period. It doesn't have to be 3 days. It could be 2 days, or 5 days, or two weeks. But, for the period you choose, eat only vegetables. No meat, cereals, breads, milk, cookies, etc. 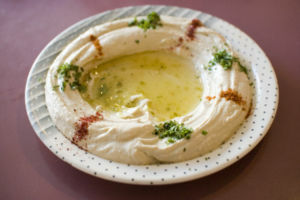 --Hummus--add a little bit of olive-oil, chopped garlic, paprika, red pepper. --Tabouleh--I get mine from Trader Joe's and it's delicious. 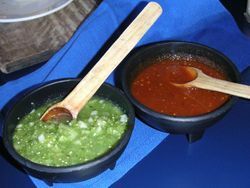 --Salsa--Low in calories, rich in lycopene and other flavonoids, with no nutritional downside. Also, pico de gallo--chopped tomatoes, onions, jalapeno chiles, cilantro, cucumbers. --Mustards--hot, yellow, brown, spicy, gourmet, horseradish, etc. --Cocktail sauce--i.e., ketchup and horseradish. Use the low-carb ketchup made without high fructose corn syrup. --Tapenades--e.g., olive tapenade made with chopped olives, capers, and olive oil. --Pesto-made with basil, garlic, and olive oil. --Spices and herbs--basil, arugula, peppers, mustard powder, garlic, cilantro, ginger, etc. --Vinegars--wine, Balsamic, rice, apple cider. --Infused olive oils--infused with garlic is especially delicious,e.g., added to hummus. --Bean dips--white bean dip, roasted bean dip, etc. With the varieties of ways to jazz up your vegetables, you couldn't possibly be bored. For example, for breakfast on day 1, eat sliced cucumbers and green peppers dipped in garlic-infused olive oil hummus and a handful of almonds. For a snack, some walnuts, sunflower seeds, sliced zucchini dipped in salsa. For lunch, a salad with an olive oil and balsamic vinegar dressing. For dinner, tablouleh, a cucumber and tomato salad, celery sticks dipped in pico de gallo. This approach works nearly as well as fasting. A half-pound per day weight loss or more is common and painless. You'll also feel great living on low glycemic index foods.